Maybe he is in love. As dedicated as he is, „Make You Feel My Love“ is almost purring. Maybe after the good three-month break of his „Never Ending Tour“, which he starts again on Sunday evening in Dusseldorf, he just missed the stage and the music. Anyway, Bob Dylan is just amazingly good this evening. Even the harmonica comes back after a long abstinence. And so good! And then, in the end, Bob Dylan even bows to the audience. An evening to kneel down. Stravinsky blurts out of the darkness. Then the headlights go on and Bob Dylan stands at the piano. Silver-gray shirt, dark trousers with a wide bright side seam, tonight without hat. The band goes straight to „Things Have Changed“. It only takes a moment for the audience to realize in the second piece that it is „„It Ain’t Me, Babe““. How many times has he been singing the song for the past 55 years? Anyway, Dylan plays a few interesting chords. „Highway 61 Revisited“ sounds like a country band playing rock’n’roll, and Dylan coughs the lines like a truck driver in transit, and in the end, the voice rolls over. The first really nice moment is „Simple Twist Of Fate“. The curtains are illuminated in red, the folds cast heavy shadows in the fabric, small lamps on the stage create an atmosphere like a dance cafe in Brooklyn, and so does the song, Dylans presents the song rather than chanting. We know that this song turns things upside down. Occasionally the „he“ becomes the „I“ while the woman turns out to be a prostitute in the docks and the singer is an old man looking for the charms of a young woman. Dylan certainly did not perform this song so convincingly as it did tonight. And then with his harmonica solo, which cuts like a knife into your heart. In fact, the song sounds like the storyteller is looking back on his past, as if he were so far from the past that he now shares his personal memories of a deep pain with a young person. Oh, you could drown in this song. 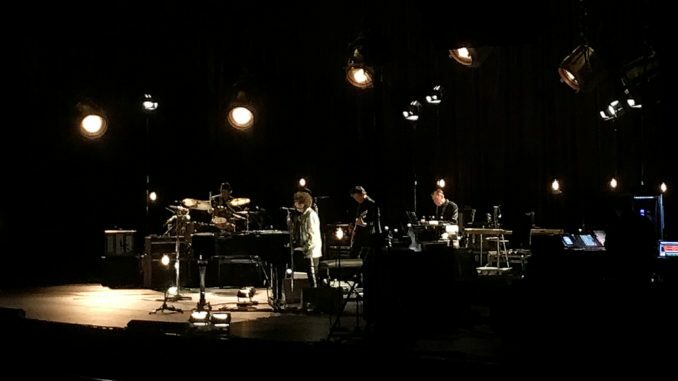 Stormy is „Cry A While“, with shadows in the background, reminiscent of a scaffolding, the mood is a sluggish rock, and Dylan hammering down on the piano keys. His declaration of love to Rome, „When I Paint My Masterpiece“ comes along like a light waltz, and when he arrives in Brussels, Dylan blows a lonely harmonica. The set was far from finished: „Like A Rolling Stone“ sounds almost like a pop song, in the end so light that Snoopy would dance on it. „Early Roman Kings“: Dry blues rock, „Do not Think Twice, It’s All Right“ as a melancholic ballad with a pianosolo bordering on a traditional one. like from a westernbar. „Love Sick“: He sings it like a man who is unshakeable so fast, but who in the end stands by his feelings. „Thunder On The Mountain“ is one of the big surprises of the evening. Dylan, who turns 78 in May, sings the song with youthful strength and joy („feel like my soul is beginning to expand“). „Soon After Midnight“ has a strong country touch, and with a wild, dedicated interaction, the band closes the evening with „Gotta Serve Somebody“. The encore features a violin-filled version of „Blowin‘ In The Wind“, which Dylan recites as a message to a good old friend. With the rock number „It Takes A Lot To Laugh, It Takes A Train To Cry“ the fans are sent home after almost 100 Minutes. Bob Dylan is not one who does what you expect him to do. And that’s good. That’s exactly what the fans love about the gawky man. His songs are for eternity, and he sings them somehow different every night. Sometimes you have to listen very concentrated to discover what he’s playing. In that sense, he is perhaps the only jazz man among rock musicians. And he is amazingly good at voice. He just sings fantastic. He models, flutes, unscrews the sounds and lets them ebb away, and he sings in a sonorous low register like sweeping butter over your heart. The cacophonic interludes were also wonderful, from which each of the next songs formed out. That made the show a one-stop event. He kicked off the tour at the Mitsubishi Electric Hall in Dusseldorf. If he appears at the next concerts as well as tonight, then the fans can look forward to great shows.